موسوی, نعیم, ابراهیم‌‌زاده اردستانی, وحید. (1392). آزمون ثابت بودن چگالی با تانسورگرادیان به‌منظور به‌کارگیری صحیح روش فضای گرادیان. 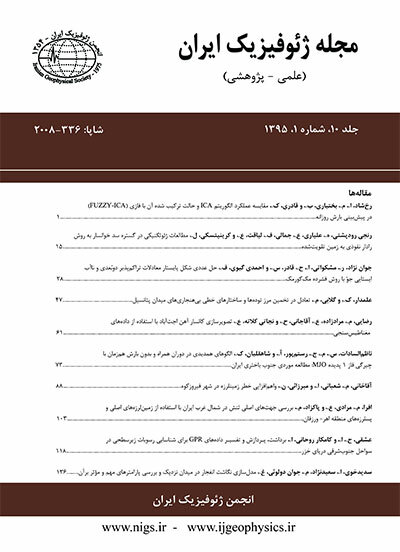 مجله ژئوفیزیک ایران, 7(3), 107-118. نعیم موسوی; وحید ابراهیم‌‌زاده اردستانی. "آزمون ثابت بودن چگالی با تانسورگرادیان به‌منظور به‌کارگیری صحیح روش فضای گرادیان". مجله ژئوفیزیک ایران, 7, 3, 1392, 107-118. موسوی, نعیم, ابراهیم‌‌زاده اردستانی, وحید. (1392). 'آزمون ثابت بودن چگالی با تانسورگرادیان به‌منظور به‌کارگیری صحیح روش فضای گرادیان', مجله ژئوفیزیک ایران, 7(3), pp. 107-118. موسوی, نعیم, ابراهیم‌‌زاده اردستانی, وحید. آزمون ثابت بودن چگالی با تانسورگرادیان به‌منظور به‌کارگیری صحیح روش فضای گرادیان. مجله ژئوفیزیک ایران, 1392; 7(3): 107-118. یکی از روش‌‌های تفسیر داده‌‌های گرانی که به‌منظور تعیین عمق ساختار مدفون از آن استفاده می‌شود، روش نمودار فضای گرادیان است. در گام نخست، پارامتر‌‌های لازم از قبیل طول و زاویه از نمودار گرادیان افقی برحسب گرادیان قائم یا همان نمودار فضای گرادیان، استخراج می‌شود. سپس با انتقال این پارامتر‌‌ها روی نمودار گرادیان قائم برحسب نیم‌رخ‌‌، امکان تعیین عمق فراهم می‌آید. یکی از شرط‌‌های استفاده از روش نمودار فضای گرادیان، ثابت بودن چگالی محدوده بی‌هنجاری‌‌ است که در صورت برقرار نشدن این شرط، تفسیر نادرست است. برای بررسی یکنواخت بودن چگالی بی‌هنجاری‌‌، می‌توان آن را به‌صورت یک مکعب در نظر گرفت که خود به چهار مکعب یا منشورتقسیم می‌شود. اگر چگالی و اندازه همه منشور‌‌ها یکسان باشد، نمودار مؤلفه GYX دارای چهار قله متقارن خواهد بود. بررسی تقارن موجود بین قله‌های نمودار مؤلفه GYX تانسور گرادیان نشان می‌دهد که تغییر فاکتور چگالی در هر یک از منشور‌‌های مدل به‌صورت بر هم خوردن تقارن نمودار ظاهر می‌شود. ازاین‌‌رو نمودار پیش‌گفته درنقش ابزار تعیین ثابت بودن چگالی یا به‌عبارت ‌دیگر ابزاری برای انتخاب داده‌‌های قابل تفسیر در روش نمودار فضای گرادیان که نیازمند شرط ثابت بودن چگالی در کل حجم بی‌هنجاری‌‌ است، مطرح است. آزمون مؤلفه GYX تانسور گرادیان در مورد داده‌‌های واقعی نشان داد که چگالی در قسمت نخست از نیم‌رخ‌‌ داده‌‌ها با تقریب قابل‌‌قبول، ثابت است. به‌کارگیری روش نمودار‌‌های فضای گرادیان در تفسیر این قسمت از نیم‌رخ‌‌، نتایج قابل‌‌قبولی در تعیین عمق بی‌هنجاری‌‌ را به‌دنبال داشت که در مقایسه با نتایج به‌دست آمده از روش اویلر در تعیین عمق از دقت زیادی برخوردار بود. باتلر که مبدع روش تفسیر هندسی به‌‌کمک نمودارهای فضای گرادیان است، فهرست‌نامه‌ا‌ی عرضه کرده است که در آن شکل نمودار فضای گرادیان کلیه ساختار‌‌های متداول در تفاسیر ژئوفیزیکی به چشم می‌خورد. ازاین‌رو چنانچه محاسبات به‌‌درستی صورت گیرد، نمودار فضای گرادیان، مشابه یکی از شکل‌‌های پیشنهادی خواهد بود. در تفسیر بخش دوم از نیم‌رخ‌‌ مشاهده شد که نمودار فضای گرادیان حاصل با هیچ یک از نمودار‌‌های پیشنهادی باتلر شباهت ندارد لذا امکان به‌کارگیری آن روش وجود نخواهد داشت. آزمون ثابت بودن چگالی برای قسمت دوم با نیم‌رخ‌‌ داده‌‌های واقعی صورت گرفت و معلوم شد که چگالی در این قسمت از نیم‌رخ،‌‌ ثابت نیست. Gradient Space Plot (GSP) is a structural method for gravity data interpretation, which is used for depth estimation of buried structures. In this structural interpretation, determination of depth, size, geometry and density contrast using a gravity gradient is proposed. In 1995, a general procedure for classifying and analyzing gravity gradient profile data over 2D structures was presented completely by Butler. In that research, it was shown that GSP, i.e. plots of horizontal gradient versus vertical gradient, present the complete magnitude and phase information on the gradient profiles simultaneously. To perform this method, necessary parameters like length and angle are initially extracted from the gradient space plot. Then, they are transmitted to a plot of vertical gradient versus profile, which leads to depth estimation. It is worth remarking that a comparison of measured or calculated gradient space plots to a model gradient space plot catalogue allows a rapid, qualitative determination of structure or geometry. Here, we suppose the anomaly is similar to one of the presented structures in the Butler Catalogue. We know that the Butler method requires no quantitative information or assumptions regarding the density contrasts. In these structures, for a correct interpretation, the density is assumed to be constant. To assess the density consistency, we model any arbitrary anomaly with a series of right rectangular prism pairs, overlaid with their sides and parallel to x-axis. In previous research a method was developed to determine the gradient tensor components, based on a model consisting of four right rectangular prisms of the same size. On the other hand, a change in the density value for any prism leads to different values of a GYX plot peaks. Hence, a GYX plot can be used as an attribute to show a change in density over the anomaly. In other words, it is employed as a tool to select interpretable data in the GSP method in which the density of the considered anomaly should be constant. A 3D plot of the GYX component for the gravity gradient tensor produces a pair of peaks which lie above and below the model surface. The number of the peaks is equal to the number of the prisms. The most important feature of this plot is the complete symmetry that exists in its peak values which can be obtained from the constant density in all prisms. In the case of four prisms, we have four peaks the amplitudes of which are proportional to density contrasts of any prism. It can be possible to avoid the perspective issues by 3D rotating in a cyclic way. The 2D plots contain more accurate information to the size of the peaks. Application of the gradient tensor test for real data showed that the density was constant in the area of the first part of the profile. In the first section of the profile, present interpretation compared favorably with the Euler method. The density constancy test for the second part of the profile was performed. The density in this part of the profile was not constant. Therefore, the reason for an ill-posed usage of GSP was shown. Space plots due to this section of profile were not similar to those of the Butler catalogue. ابراهیم‌‌زاده‌اردستانی، و.، 1389، گرانی‌‌سنجی کاربردی، انتشارات دانشگاه تهران. Butler, D. K., 1995, Generalized gravity gradient analysis for 2-d inversion: Geophysics, 60(4), 1018-1028. Fajklewicz, Z. J., 1976, Gravity vertical gradient measurements for detection of small geological and anthropogenic forms: Geophysics, 41, 1016-1030. Hammer, S., Anzoleaga, R., 1975, Exploring for stratigraphic traps with gravity gradient: Geophysics, 40, 256-268. Marson, I., Klingele, E. E., 1993, Advantages of using the vertical gradient of gravity for 3-d interpretation: Geophysics, 58, 1588-1595. Mickus, K. L., Hinojosa, J. H., 2001, The complete gravity gradient tensor derived from the vertical component of gravity, a Fourier transform technique: J. Appl. Geophys., 46, 159-174. Mohan, N. L., Sundararajan, N., Seshagiri, R. S. V., 1982, Interpretation of some two dimensional magnetic bodies using Hilbert transforms: Geophysics, 47, 376-387. Montana, C. J., Mickus, K. L., Peeples, W. J., 1992, Program to calculate the gravitational field and gravity gradient tensor resulting from a system of right rectangular prisms: Computers and Geosciences, 18(5), 587-602. Mousavi, N., 2009, Using 3-d gravity gradient space plots instead of 2-d; a forward step for basin analysis: SAGA 2009, 292-295. Mousavi, N., Ebrahimzadeh-Ardestani, V., 2010, General usage techniques of 2-d gradient geometrical analysis for gravity data of any geologic structure: Proceeding of Iranian Geophysical Society 14th conference, Tehran 11-13 May. Ram, B. H. V., and Rao, D. A., 1991, Application of the Hilbert transform for gravity and magnetic interpretation: Pure Appl. Geophys., 135, 589-599. Shuey, R. T., 1972, Applications of Hilbert transforms to magnetic profiles: Geophysics, 37, 1043-1045.